Holy Name of Jesus Church in Brooklyn, New York, will celebrate the Solemnity of the Most Sacred Heart of Jesus this evening at 7:00pm. For those new to or curious about the Latin Mass, there will be a fully instructional program with cues and translations. The church is located at 245 Prospect Park West. 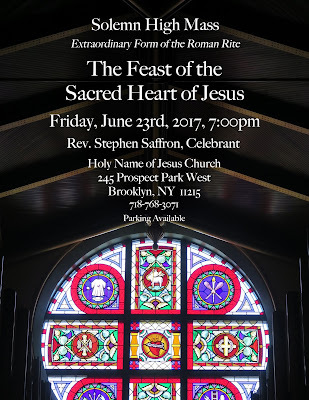 Here is a note from the choir director about the music featured in this Mass: Six singers, the best of the best that New York City offers, will sing chant and polyphony as the Church has so gloriously done in the past for the feast of the Most Sacred Heart of Jesus. The Mass setting is by David Adam Smith, as well as the offertory motet. At communion the hymn Cor dulce in three voices will be sung, as well as appointed palms.